Banjara culture is an unique in style.The birth, death, food style, dressing pattern. Festival, marriage ceremony has not been taken away by other community in today. The traditined by the virtue of their living the tandas.The banjaras to begin their life were pure vegetarians. They use to worship SUN god: the bhog called now :HOMA: the hindu tradition was the original culture. The division of banjaras as Chawhan, Rathod, Pawar, Jadhav, are drived from the legends of Lords Krishna. The relationship between the Brahmin and non Brahmin can be found the culture of banjaras. The kshatstriya, Arya, vyshya and shudra, the system of Vedic period, traces that banjaras are kshatriyas, the follower of Rama and Krishna. The culture of Holi. Teej, are the festivals which relates to Ramayana and Mahabharata period. If the culture of banjaras is co-related to other religion, some of culture are found in them but all the culture existed in the society is available with banjaras. Today’s judiciary system is copied from the judiciary system of banjaras, Davsan, Panch, Nayak, Karabhari, the members in the system to resolve the disputes. The culture of Dhavalu: depicts the pain of departure and unification after long stay leaving fathers house symbolizes, the remembrance of pain of running away from the harrappa and mahanjodaro, built house building. The creation of “Ghota” at the time of marriage , and “Lapsi” at the time of worshiping godess Durga speaks of Banjara`s pure culture of devotion. To take Sevabhaya as their guru who lead banjaras.The contineous frightened life in the hills and forest lost their princely status and the sofesticated culture, which lead to hard and rough culture. This forest dwelling culture is not coping with the modern culture. The food style of Banjara is boti-bati sangati, toti tadi, bati bhoonji, bhoonji lapasi rabadi, saloi, halwni, kardao, kado and drinks like bhang and ghota. Woman were 5 to 6kgs of ornaments made out of metal, ivory. The singing system of Banjara by Bhadi who spells the culture of Banjara without any script. In the judiciary system the dispute of two rivalry group will be solved by the panch comprising of Naik, Karbhari, Dawasan and they do hassb-Nasab in the meeting called Malao. The language is called goreboli being a language linked Indo-Aryan group and presently the Hindi language Davanagari script. Inthe marriage there are system like gol khayer geeth telere geeth, vadai geeth and they treat the bride and bridegrooms with Haladi Mandao, Mehandi and Dhavalo. They also perform a theej festival which is linked with Sri Ram and Sri Krishna. The traditional food of Lambadis is bati (roti). Daliya is a dish cooked using many cereal, such as wheat or jawar. Banjara people also enjoy many non-vegetarian foods. Among the non-vegetarian dishes unique to them are saloi, made from goat blood and other goat parts. The Banajara are also known for preferring spicy food. Women are known to wear colorful and beautiful costumes like phetiya (as ghagra) and kanchalli (as top) and have tattoos on their hands. The dress is considered fancy and attractive by Western cultures. They use mirror chips and often coins to decorate it. Women put on thick bangles on their arms (patli). Their ornaments are made up of silver rings, coins, chain and hair pleats are tied together at the end by chotla. Men wear dhoti and kurta (short with many folds). These clothes were designed specially for the protection from harsh climate in deserts and to distinguish them from others. Their customs, language and dress indicate they originated from Rajasthan. They live in settlements called thandas. They lived in zupada (hut). Now many of them live in cities. They have a unique culture and dance form. On many occasions they gather, sing and dance. Their traditional occupation is nomadic cattle herding. Now they are slowly moving into agriculture and trade. The accurate history of Lambanis or Lambadis or Banjaras is not known but the general opinion among them is that they fought for Prithvi Raj Chauhan against Muhammad of Ghor. The trail of the Lambadi/Banjara can be verified from their language, Lambadi borrows words from Rajasthani, Gujarati, Marathi and the local language of the area they belong to. 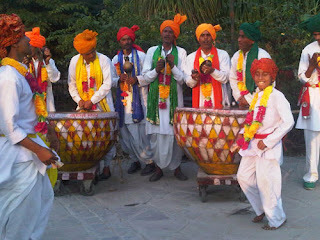 Banjaras originally belong to Rajasthan, who migrated to southern parts of India for trade and agriculture. They settled down in the southern or central area of the country and slowly loosened contacts with Rajasthan, and their original community. Over a period of time both the communities separated and they adopted the local culture. The language spoken by Banjaras settled in Yavatmal district of Vidarbha, Maharashtra is an admixture of Hindi, Rajasthani and Marathi. Lambadi Dance is a special kind of dance of Andhra Pradesh. In this form of dance, mainly the female dancers dance in tune with the male drummers to offer homage to their Lord for a good harvest. At Anupu village near Nagarjunakonda, Lambadi dance originated. They are actually semi-nomadic tribes who are gradually moving towards civilization. This dance is mainly restricted among the females and rarely the males participate in Lambadi dance. 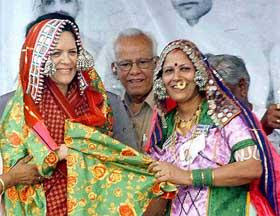 Lambadi is a special kind of Folk Dance which involves participation by tribal women who bedeck themselves in colorful costumes and jewelry. Members of the same gotra cannot marry as they are considered brother and sister, a term known as bhaipan (brotherhood). Members of different gotras may marry, and this state is known as kai-laageni (can marry). Traditionally, the jaaths of prospective couples are checked by experts known as dhadi bhaat who knew the gotra/jaath system and could identify proper marriages.